This weekend, many of us have been deeply impacted by the news on Friday evening of a highway accident near us that claimed the life of someone we knew well and left her husband in critical condition in the hospital. This has affected me deeply on a personal level. During the past year I had spent quite a number of occasions enjoying the hospitality this couple offered while I served as a transition pastor in their church. Besides sharing in delicious food — most often prepared by the husband — we talked about many common interests. We knew many of the same people who served in church and Christian leadership in western Canada. Both were deeply involved in provincial politics, and both have had long careers in professional administrative roles in industry, education, health and Christian ministry. Both loved the local church and were deeply interested in its ministries and development. I felt privileged to know them, to experience their gracious hospitality and to share in conversation about theology, ministry practice, and politics. My last blessed encounter with them was when they came to visit me in Vancouver in my hospital stay at the beginning of February. Many of us who knew this couple are seeking to come to terms with the tragic news of her loss and his critical injury. Most of us travel extensively on the highways of our country without thinking very much that we might not arrive safely at our destination. Though we are conscious of potential hazards, especially in winter conditions, we feel relatively secure in our expertly-designed vehicles and well-maintained highways. We all know that there are always risks involved in highway travel. But knowing that every venture in life has risks, we engage anyways trusting that the odds of getting into serious trouble are minimal. But there are exceptions. Sometimes in the midst of our positive expectations something goes horribly wrong: the train goes off the track, a plane misses the airport, a bus full of young hockey players hits a transport truck that blows a stop sign, a shooter goes on a rampage at a school, a truck and car somehow cross the highway divide and crash — and innocent lives are tragically lost. We call them accidents. Some are minor because they merely involve property damage. Others result in injury and even death. It’s in this latter case that we are forced to think even more seriously about the nature of life and how these things happen. Recently, as many readers of my Blog will know, I have written about change in a book on that subject. 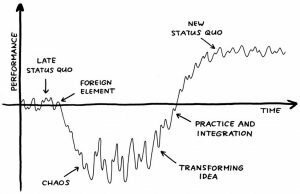 In it, I include this diagram that was developed by Virginia Satir about 70 years ago to explain how we tend to process change. She theorizes that when we are forced to deal with a sudden change in our lives (through loss of one kind or another) we are thrust for a time into a valley of chaos. As I think of our recent experience of loss I’m sure that many of us feel we are in that kind of place. When my wife and I heard this news on Friday evening this weekend, we were incredulous. How could it be that a person we knew so well, had such high profile in the community, and had been such an important part of our lives was suddenly gone, and that her husband was now in such a serious life-threatening state? What happened? How will the family and those who depended so much upon them cope with all of this? Both were strong Christian believers and gave themselves to work in the church and our world from that perspective. How could God allow this to happen? What might be His larger purpose in all of this? We all have ways of processing serious loss. In one way or another and to varying degrees, we experience what Elizabeth Kubler Ross identified as the five stages of grief — denial, anger, bargaining, depression, and acceptance. The first four are especially peculiar to the “valley of chaos.” I too have been there. I tend to be there now in this case. For me the valley often involves reflection, prayer, biblical meditation, discussion, and journaling. What I like about Satir’s theoretical diagram is that it implies it’s possible to move beyond the “valley of chaos.” Though the diagram wasn’t prepared for a Christian purpose, I can’t help but think it has special meaning in that context. Acceptance is an important step toward resolution and progress in such circumstances. Acceptance, I’m sure, comes more quickly for those who deal with tragedy from the perspective of faith. Christian faith leads us quickly to consider the triumph of Jesus Christ over death, sin, and evil. The experience of God’s love from others in the midst of loss can lead us to see that God has good things in mind for us beyond the suffering of the moment. Undoubtedly, God uses people, prayer, possibly some insight through a song, a poem, a sermon, a book, or the Bible itself, to bring about healing and the start of upward progress. Corrie ten Boom of holocaust rescue fame was famous for saying, “no pit is so deep, but that God’s grace is not deeper still.” She knew and worked from the perspective that though human suffering is deep and dark, God’s grace is able to reach us in the worst of tragedies and bring us back into the light. And in the end, despite the pain of our loss, it’s possible for us to experience life on an even higher plane than we had experienced before. So while our hearts grieve the current loss and suffering of our friends, they are focused on the hope we have been shown and promised in our Lord and Saviour, Jesus Christ. Our hope and prayer for the family, and the many people who were impacted by the lives of this couple, is that God’s grace will prevail in greater ways than we could ever have imagined. Soli Deo Gloria!